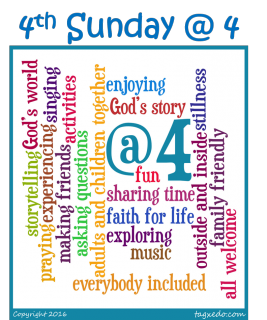 4th Sunday @ 4 is a short (about 40 minutes) family service which we do together. There is a simple structure to the service which comprises songs, a Bible reading, various activities, a short talk and prayers followed by refreshments. We aim for as much participation as possible (!) but anyone is welcome to come and simply enjoy. There is a soft toy area for very young children. A great place to meet other families.